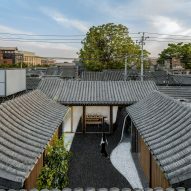 Beijing practice Arch Studio has renovated a traditional courtyard house in the Chinese capital, adding grey-brick paving that flows from the floor of the outdoor space to form internal walls and roofs. 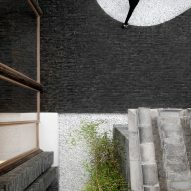 The building is situated in Beijing's Dashilanr district, south of Tiananmen Square, and was given the title Twisting Courtyard by Arch Studio. 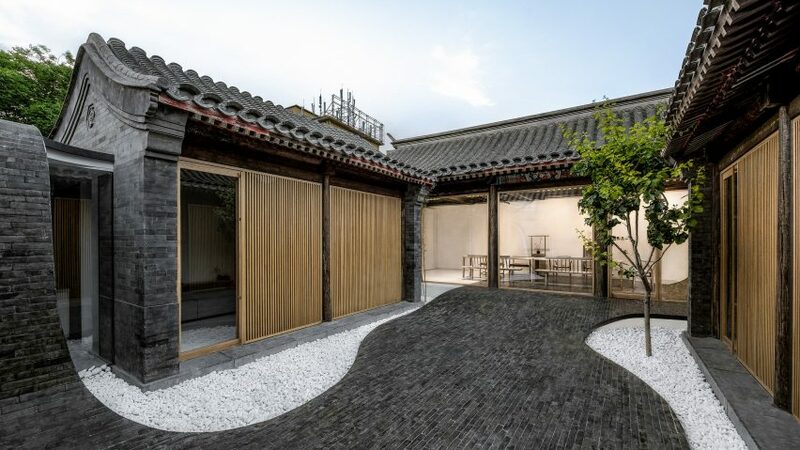 The format of the property is that of a traditional Siheyuan – a historic residential typology with buildings arranged around a central courtyard. 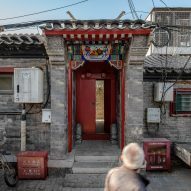 Collectively the Siheyuan and their courtyards form the hutong neighbourhoods Beijing is famed for. 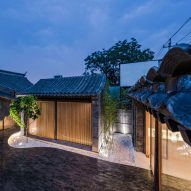 Many of these buildings in Beijing have been demolished to make way for more contemporary, space-efficient developments, but Arch Studio was tasked with upgrading the existing structure to create spaces suitable for modern living. Intended primarily for use as a residence or hostel, the various spaces surrounding the courtyard can also be rented for public events, meetings or parties. 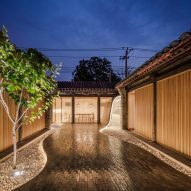 A traditional gated entrance leads to a passage that connects with the central courtyard, which provides a public space viewed as a continuation of the city. The various private and public rooms are arranged around the courtyard, which extends into the building at either end to form the internal floors of a dining space and reception area. 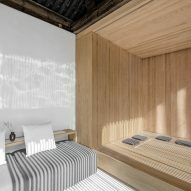 "The design aims at getting rid of the solemn and stereotyped impression given by Siheyuan, and creating an open and active living atmosphere," explained the studio. 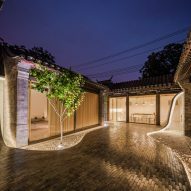 "Based on the existing layout of the courtyard, the undulating floor is used to connect indoor and outdoor spaces of different height." 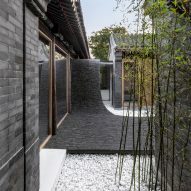 The sense of a continuous flow from outside to inside is enhanced by the way the grey-brick paving curves upwards over walls and roofs to create a seamless link between different parts of the building. Functional spaces including a kitchen, office and bathrooms are accommodated beneath the curving roof sections, while the public areas look directly onto the courtyard through full-height windows. 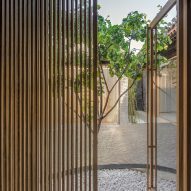 On either side of the courtyard, built-in furniture units integrated into the existing timber-framed structure facilitate the flexible use of spaces that are shielded behind slatted screens. 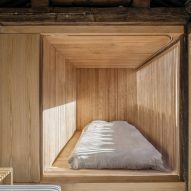 These wooden boxes contain tables that can be raised up from the floor to create tea-drinking areas, while at night they can transform into a pair of bedrooms. 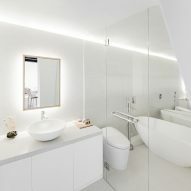 An additional room tucked away in the northwest corner features a bed that can be stowed away in a wall of fitted units to free up the space for other daytime uses. 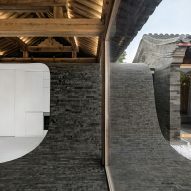 Arch Studio also based a new food-processing plant in the Hebei Province on hutong housing, with individual buildings set around a courtyard, and has completed a Buddhist shrine set beneath a grassy mound near a river. 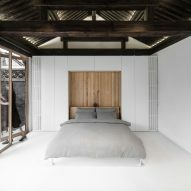 The studio has also transformed a former hutong in the city into a tea house with curving glass walls. Photography is by Wang Ning & Jin Weiqi.